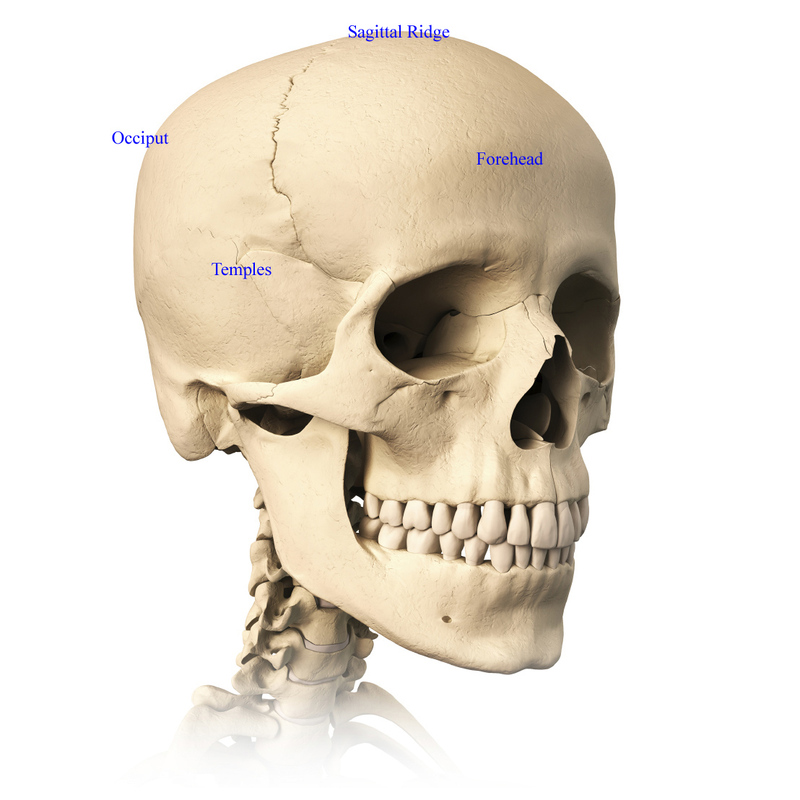 Skull reshaping is done on any of the structures that lie above the face. The simplest way to make the difference between the head and the face is to envision a ring that wraps around the head at the level of the eyes. Anything above is the head or skull and what lies below is the face. This can also be called the ‘northern hemisphere’ of aesthetic craniofacial surgery. The outer portion of the skull is a collection of five large bones that have been well described anatomically. (Frontal, temporal, parietal and occipital bones) From an aesthetic standpoint, however, it is better to describe head and skull shape concerns in terms of aesthetic units. This provides a more common language for patients to express their concerns and for the surgeon to better understand them. 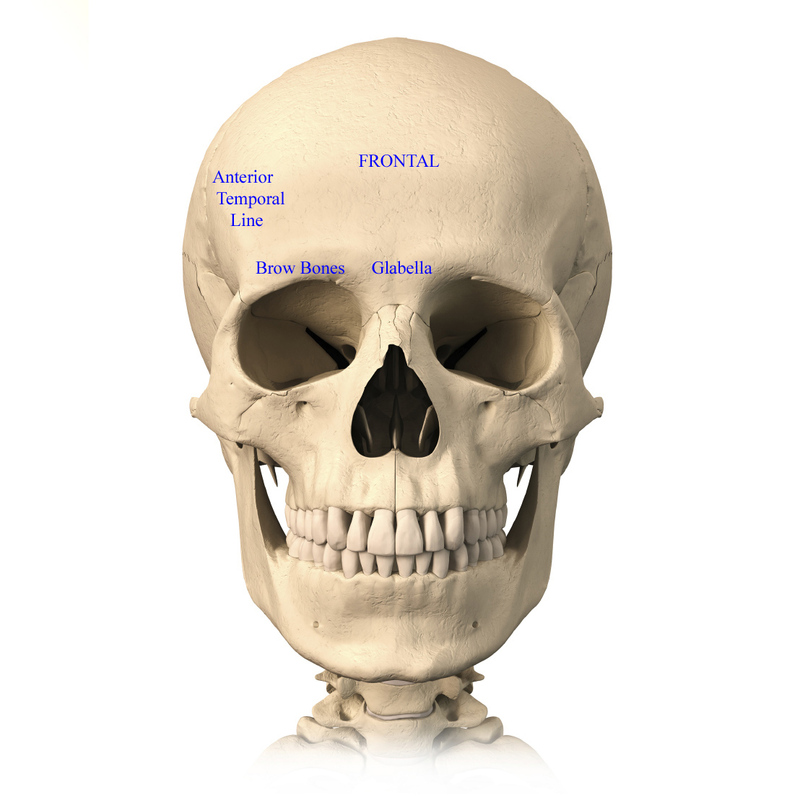 The forehead or frontal bone consists of five aesthetic bony regions. The brow bones or supraorbital rims, the central glabella (between the brow bones), the anterior temporal lines (the transition between the forehead and the upper temporal region), and the traditionally perceived true forehead. The large forehead expanses is bordered to the south by the brow bones, the east and west by the temporal lines and the highly variable northern border of the hairline. 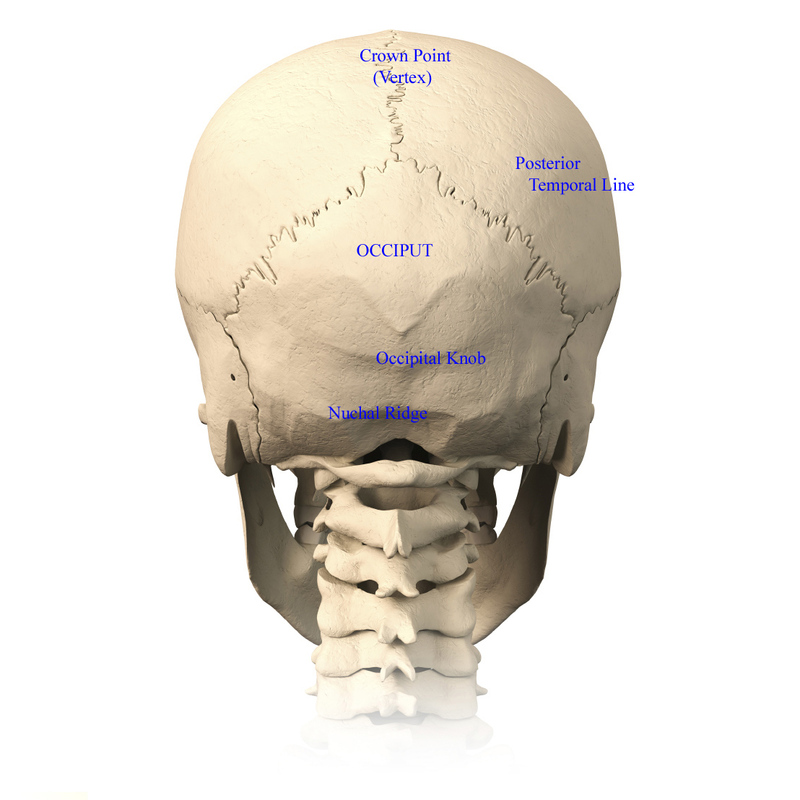 The back of the head or occipital bone has four aesthetic bony regions. At the lower end is the nuchal ridge where some neck muscles attach. The sides are the back ends or the posterior extensions of the temporal lines. 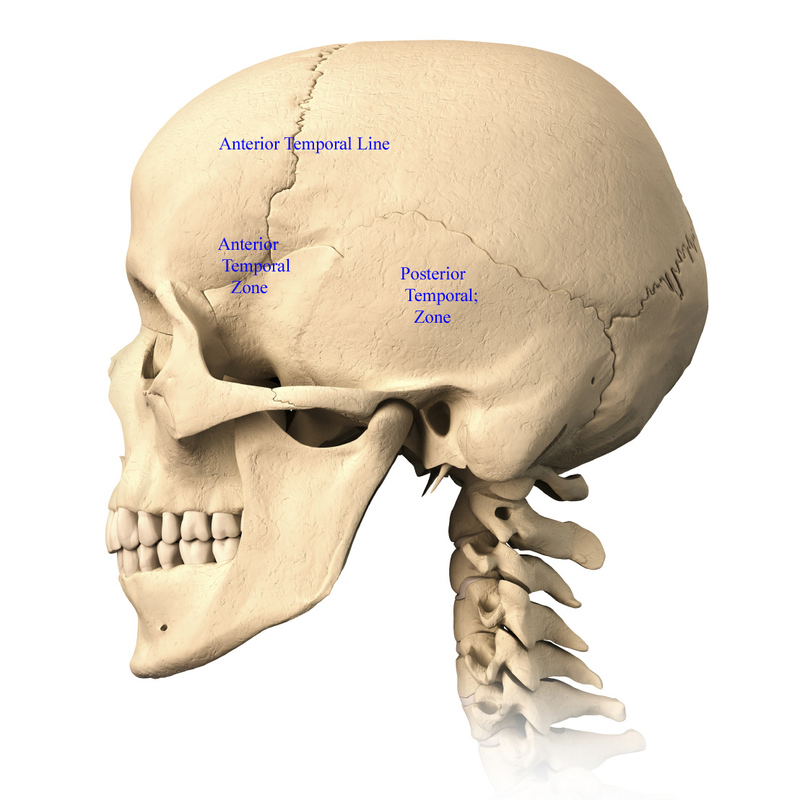 The top of the back of the head is often called the vertex and represents the original midline location of the posterior fontanelle or baby soft spot. Between these borders lines lies the occipital convexity. The sides of the head are the temples and are comprised of two major aesthetic regions containing a mixture of bone and muscle. The anterior temporal area is what lies to the side of the eye anteriorly, the zygomatic arch inferiorly, the anterior temporal line superiorly and the hair bearing scalp in front of the ear. The anterior temporal area can also be subdivided into zone 1 (lower half) and zone 2. (Upper half) The posterior temporal area is really the true side of the head whose central area is located just above the ear. It is bounded by the ear inferiorly, the temporal line superiorly and posteriorly and the temporal hairline at its front edge. Underneath the scalp the two temporal regions are defined by the anterior and posterior bellies of the temporal muscle and the dramatic difference in shape of the temporal bone. (Anterior it is highly concave while posteriorly it is convex shaped. The top of the head, often referred to as the crown, is one large convex aesthetic region bordered by the forehead, temples and occipital areas. It is one distinguishing feature is a midline sagittal line or ridge which can be present in variable degrees.